Independent lens maker Sigma has announced a new DSLR zoom lens designed for travellers and backpackers, or anyone who wants an all-purpose zoom lens that's both light and small. The Sigma 18-250mm f/3.5-6.3 DC Macro OS HSM is different because it's been manufactured using a special polycarbonate material called Thermally Stable Composite (TSC). According to Sigma, TSC enables lenses to be both smaller and lighter. The virtual elimination of internal and external barrel expansion has enabled Sigma to design a lens that's both smaller and lighter. For example, the non-macro 18-250mm lens without TSC weighs in at 623g, whereas the new TSC macro version tips the scales at just 470g. Physically the lens is about 1.3cm shorter and about 0.5cm smaller in diameter, and has a filter thread of just 62mm. This new walkabout lens is designed for DSLR cameras using APS-C/DX-size sensors, and offers a 35mm equivalent focal length of 28-400mm. Sigma's optical stabilisation (OS) technology is also included, which should mean sharper handheld shots at lower shutter speeds. The magnification ratio of the macro function is 1:2.9 and all 13 elements that make up the lens are multi-coated to reduce flare and ghosting. For quieter and faster autofocusing, Sigma has incorporated its Hyper Sonic Motor (HSM) mechanism, which makes it ideal for newer budget DSLRs from Nikon that don't have focus motors built into the camera body. There's also a rounded, seven-blade diaphragm that should produce images with a softer and more pleasing bokeh. The new lens will be available in Sigma, Sony, Nikon, Canon and Pentax mounts, but the first to market will be the Canon version, which is expected to launch in July 2012. Pricing and the availability for other mounts have yet to be announced. If the idea of a lightweight go-anywhere lens excites you then you can take a sneek peek at some real-life samples of Sigma's new 18-250mm F3.5-6.3 DC Macro OS HSM lens. 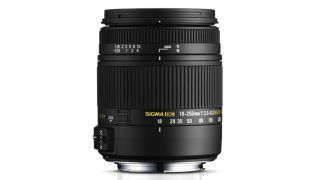 Sigma has released 16 image files taken with the new lightweight lens. All the images are available to pixel peep at full resolution and were shot using a Sigma SD 15. Click here to view the images.